Bob: Jim Rand, Chief of Lock and Dams for the St. Paul District Army Corps of Engineers, joining us this month on the Wisconsin Great River Road Microcast. The first question I have for you, Jim, is, what is a lock and dam? Jim: A lock and dam has a dual function: to ... See More create pools, and to pass traffic. 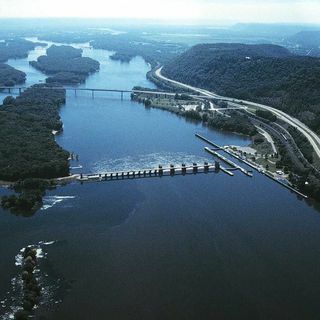 A lock and dam is very similar to a set of stairs. Each lock has its individual stair height. If we break into two parts, there’s a dam, and what that does is that allows us to maintain a 9-foot navigation channel in the upper Mississippi River. That 9-foot channel allows us to pass loaded commercial traffic – barges, towboats is what they’re commonly referred to – up and down the river system from St. Paul all the way down to the Gulf of Mexico. Bob: So the purpose mainly is for commerce on the river? Jim: Correct. The dam itself is there to maintain the 9-foot navigation channel, and that will allow us to pass commercial traffic. Bob: How much traffic goes on the mighty Mississippi River on a typical year? Jim: Last year, for us, for the St. Paul District, from Lock 10, Guttenberg, Iowa, north, we passed around 107 million tons of commodities. Bob: And that keeps how many trucks off the road? Do you know? Jim: I do. One 15-barge tow is equivalent to about 1,050 semis. So if we look at that in a length scenario, a towboat fully loaded with 15 barges is about a quarter-mile long. And those equivalent commodities in semi trucks, it’s just shy of 14 miles, bumper-to-bumper. Bob: So you’re taking a lot of traffic off the roads. That way, people will be able to get out and enjoy the Great River Road from driving it rather than having to deal with all that traffic from here to there. Bob: Jim, why would somebody want to stop by and see a lock and dam? Jim: We get a lot of people watching the eagles. We get a lot of otters around the locks, so we have a lot of people watching wildlife. The other thing that they do a lot is, they just stop by to watch boat traffic, and to watch fishermen. We get a lot of the cruise paddlewheelers – the American Queen, Delta Queen, Mississippi Queen. That’s a big event. They put their schedules out well in advance, so we get quite a turnout for those events when those boats pass through. We have several open houses at our locks and dams up and down the river that normally we try to coincide with a local community festival. We allow people on the site so they can see how everything works. We’ll let the kids blow the horn and all that kind of fun stuff. We do allow fishing around our structures from the shore, so we get a lot of fishermen in the spring, summer, fall timeframe. We’ve got a lot of ice fishermen around right now. There’s always quite a bit of action around the lock and dam. Bob: Jim, as you know, this winter has been a winter of records with all the snow that we’ve had. Once that snow starts to melt, it will obviously find its way to the Mississippi. When that happens, do you open up the locks and the dams and allow all of the water to flow so that way it doesn’t flood? Jim: The locks and dams in our district are for navigation purposes only. They’re not flood control structures. Congress has given us the authority to maintain these pools at a certain sea elevation. Our lock operators adjust that dam. There are big gates over there – roller and tainter gates – they adjust that plus or minus normally two-tenths of a foot tolerance from the guidance from our Water Control Management Office up in the district. We can hold back to only a certain flow of water – every site is a little different – and then we raise those gates out of the water and it becomes open river. Bob: What is the life expectancy of the lock and dam structure? Jim: When they were built in the 30s, the life expectancy was 50 years. Bob: Obviously, we’ve gone past that. Jim: Obviously, we’ve gone well past that. We’ve done some significant upgrades to both of our electrical systems, both to our operating systems, to our control houses. Based on our cyclical maintenance, we’ve been able to prolong the lifespan of these structures. Bob: That’s fantastic you’ve been able to do that and keep the history alive. We talked a little bit earlier about the barges. What about pleasure crafts on the Mississippi River? Are they able to lock through? Jim: Yes. We’ll lock just about anything through. The paddleboards where people stand up and paddle, we can’t lock those through, and a jet ski that you have to stand up on to operate, the reason being the operator would be in the water in the locking process. We don’t want that. Bob: Where can people find out more information about how they can see when boats may be going through, or when they can find out when some of the open houses are where they can actually go on and see the insides of a lock and dam? Jim: The best resource today is probably social media. We advertise all of our open houses through our St. Paul District Corps of Engineers Facebook page. That’s probably the one-stop shop for all of our events that are coming up. Bob: Is there a place close by each of those locks where you’re able to tie off and maybe see some of the communities like Perrot State Park or Trempealeau Mountain or downtown La Crosse or Prairie du Chien or any of those places? Jim: Yeah. Most of them have local marinas that rent out slips where you can dock your boat. I’m not sure if you can tie up a boat at Riverside [Park] in La Crosse, but I know Trempealeau, for example, has the Trempealeau Marina. They’ll allow you to tie up there. There are walking paths uptown. I know the Genoa Lock and Dam has tie-off points on the backside of their upper guide wall where recreational boaters can tie off there and go uptown. There are a lot of local resources for a boater to stop and then to walk uptown and check out the local communities.